The World Series has come and gone. Tears of joy and sheer revulsion have been shed, or just plain indifference has reared its maligned head. With bated, ahem, breath, I bring you the final results of the 2011 MLB Tournament. 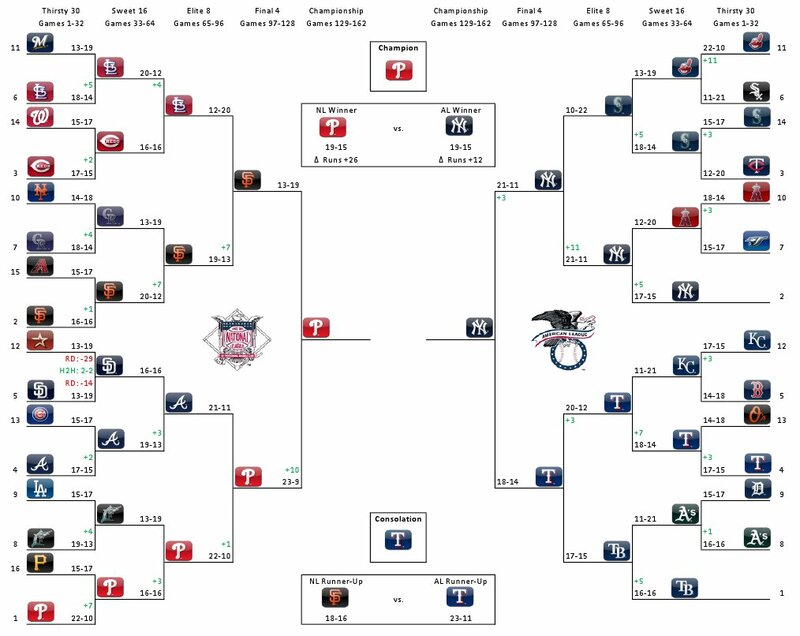 The Tourney Finals had (1) Philadelphia up against the (2) New Jork Jankees. Both teams played to a tie, 19-15, over the last 34 games of the regular season. That miraculous Tampa Bay comeback sealed the Yankees fate. Since the Phils and Yanks didn't play head to head the last 34, the finals were determined by Run Differential. Ooooh, exciting. After Baseball Reference tabulated the results, the Fightin' Phils edged the Yankees by 14 runs, giving Dan the Sticker Man the win and Dawgbones le prix booby. The consolation game was a laugher between the Rangers and Giants, a rematch of last years World Series. The Rangers ran away with a 5 game advantage, thus giving that Play at the Plate Dude the bronze medal. Originally, the winners were going to get their choice of their favorite NBA, NFL and NHL cards. Well, those cards were donated to a friend of mine who evacuated to my house during Hurricane Irene. Somethings take higher priority in life. Soooooo, I have decided to give all three winners a walk through the want lists. I've already pulled about 300 Rangers for PatP, and have a stick-load of stickers for Dan. Dawgbones has a pretty thin Want List, therefore, since he is a partial Yankee fan, he's getting something extra special from me. I'll post pictures of the prizes before I mail them. Winners, post a comment, and I'll get in touch with you for your addresses. Nice to see regular season success pay off.....i'm still not over the playoff loss though. Drop me a line when you can. Thanks for holding the tournament of champions. Thanks again for running a great contest. I'm through shedding tears! "Topps, We Have a Problem"